Can you believe that I’ve never used that pun for a title before? I can’t. 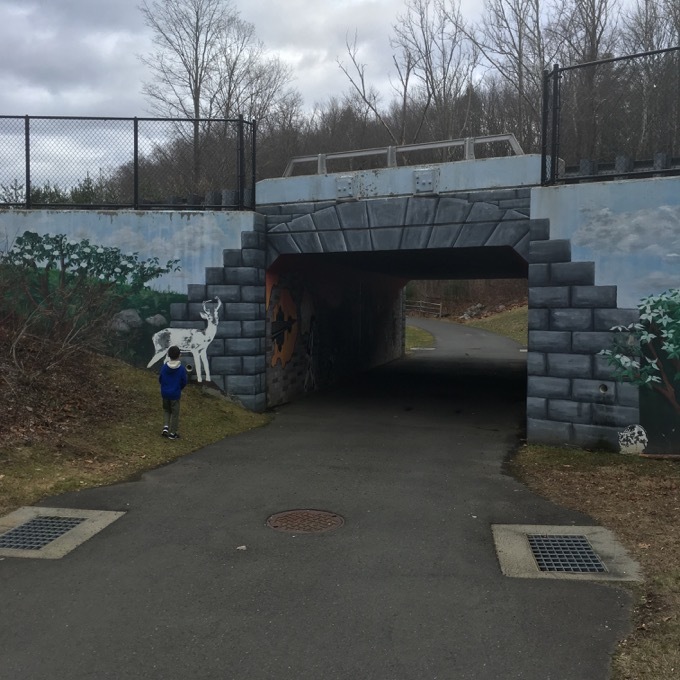 Can you believe that I’m far more interested in the two trails in the woods on either side of this tunnel than the Farmington River Trail that this tunnel is for? I can… and you probably can too. I think the decade-long (plus) efforts to cobble together an unbroken rail/canal paved trail from New Haven to Northampton, MA is fantastic, and has been hugely successful. Several towns have embraced the trail and have added all sorts of historic signage along the way. 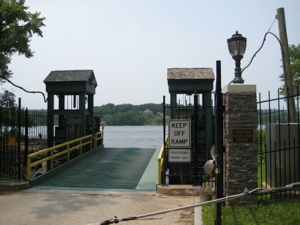 But from the parking lot off of route 4 near the Farmington/Burlington border, there are a few trails that are accessible via the Farmington River Trail, and they certainly will be hiked: The Power Dams Trail and the Taine Mountain Trails, both in Farmington. And bridging (tunneling?) the two trails is the Art Tunnel. As you can see, it’s very well done. It was created in 2008. 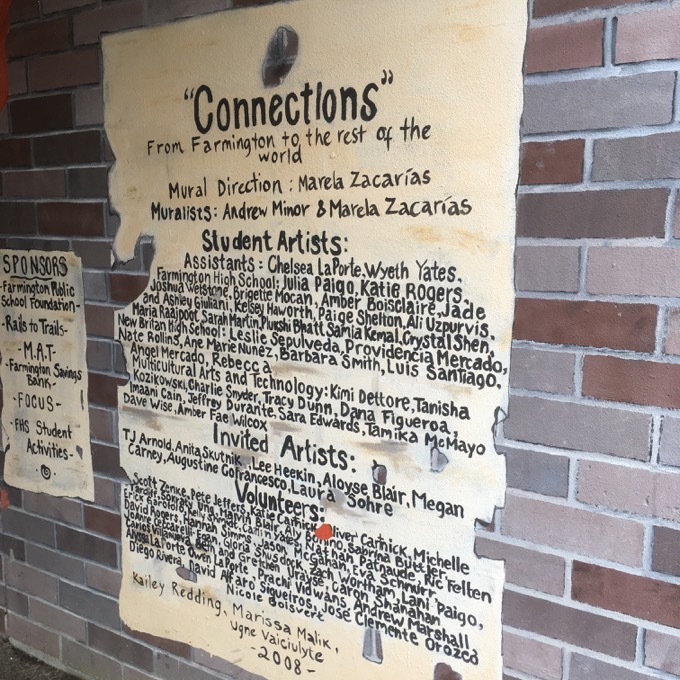 The mural is titled “Connections” and is mean to unite Farmington with the global community. 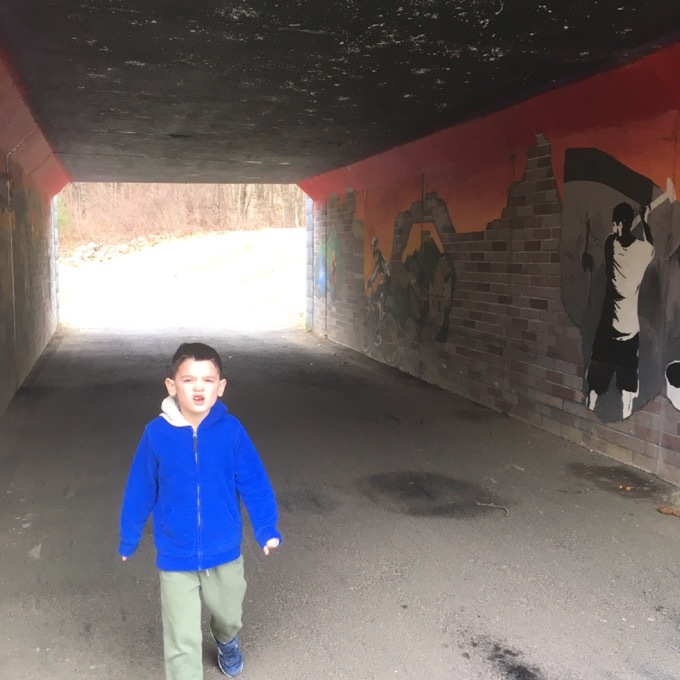 Farmington High School’s art teacher Marela Zacarias headed the effort with nearly two dozen students who painted the tunnel during after school sessions. Zacarias knows what she’s doing too… as an oil painter and muralist whose work is displayed throughout the U.S. and Mexico. 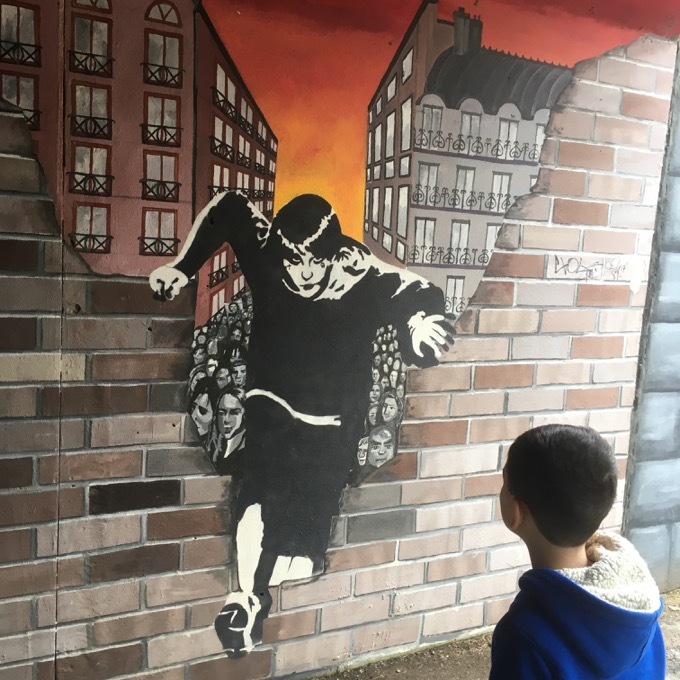 Her studies focus on mural art as a tool for social change and she has completed more than 24 similar murals in Hartford, New Britain, Massachusetts, Ohio, Washington, D.C., Maryland, Virginia and Mexico. 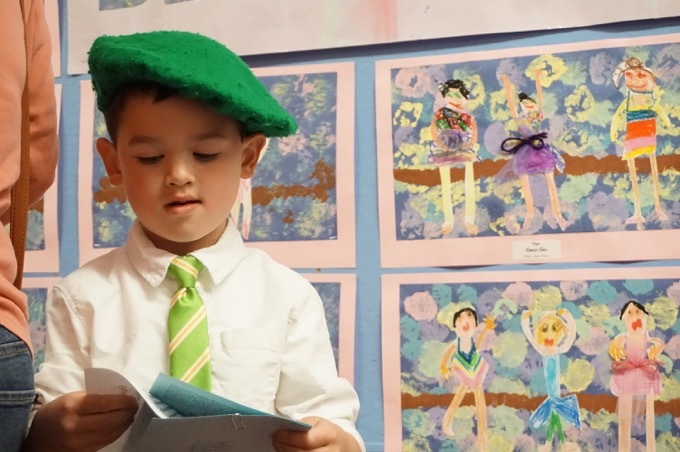 She has since moved on from teaching in town and now lives in Brooklyn, NY. I just poked around her website and many other art sites and… I love her bright and beautiful work. The mural will include references to the Taj Mahal, for example, but also to poverty-stricken children in India, sophomore Sarah Martin said. 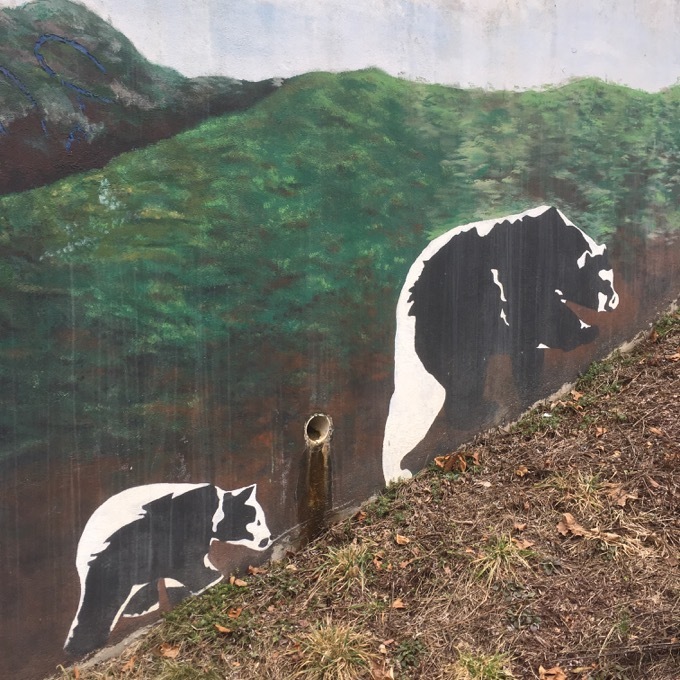 Students will paint one tunnel wall black and white and add colored windows, and apply an opposite color scheme to the other wall, Martin said. “We want to show visitors that other countries are beautiful, but also make them aware of the hardships,” she said. Oh, the innocence and optimism of youth. I love it. And Calvin did too.